Plentiful sunshine. High 77F. Winds light and variable..
Clear to partly cloudy. Low 52F. Winds light and variable. Kentucky will soon offer an educational program to its judges and court staff that will provide "trauma-informed, evidence based content" around the issues of opioid- and substance-use disorders, treatment and recovery as a way to help them make informed decisions in cases that involve substance-use disorders. 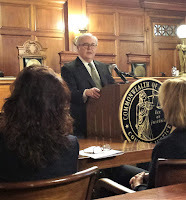 Chief Justice John D. Minton Jr. The program is called RESTORE, for "Responsive Education to Support Treatment in Opioid Recovery Efforts." It is part of the Kentucky Opioid Response Effort, or KORE, which is funded by a $10.5 million federal grant. "We want to prepare our court officials to make decisions that support recovery rather than to hinder it," Chief Justice John D. Minton Jr. said as he announced the program in the state Supreme Court chamber. "Our vision for RESTORE is that we will gain a shared understanding of substance use disorders and embrace best court practices in courts in dealing with this disease all across the commonwealth." State Justice and Public Safety Secretary John Tilley alluded to the need for this education in March when he told a room full of visiting Fulbright scholars at the University of Kentucky that Kentuckians with addictions are treated differently across the state when arrested, depending on judges' understanding of addiction and the availability of wrap-around services to help offenders. "It's incredibly disparate, and it's unjust," Tilley said at UK. "It is injustice at its best." He was unable to attend the launch of the program because of scheduling issues. The program does not offer a required course of action for the judges to follow for such offenders, but to laughter in the room full of judges, Family Court Judge Janie McKenzie-Wells of the 24th Judicial Circuit said, "When the chief makes a suggestion, we usually take it." She then added, "Obviously you have to buy in to this program and part of the educational piece . . . is to sell what we are doing to the judges and staff." The program will consist of two one-day summits in each of Kentucky's seven appellate-court districts. The summer session is titled "Understanding Opioid and Substance Use Disorder;" the fall session is titled, "Understanding Treatment and Recovery." Minton said the justice system offers a unique opportunity to help people with substance-use disorders. "The decisions made at each point of contact within the justice system can profoundly affect the recovery process of each adult, youth and family who interacts with the courts," he said. "We have a duty to understand what research puts forth as the most effective court processes, the most effective practices, interventions and treatment models that can support lifelong recovery." Wendy Morris, commissioner of the state Department for Behavioral Health, Development and Intellectual Disabilities, which oversees KORE, said Kentucky's collaboration across departments on this issue is unique. As examples, she pointed to the Department of Public Health's commitment to harm reduction, the Department of Community Based Services' work with families who are affected by substance abuse, Medicaid's robust array of treatment options, judges who volunteer their time in drug and family courts, and their own work to oversee it all. She added that the involvement of the criminal justice system will provide yet another opportunity for intervention with this population. Van Ingram, executive director of the Kentucky Office of Drug Control Policy, said the state's collaborative efforts against what he called "the worst drug epidemic our country has ever seen" are paying off. Ticking off a long list of things the state is doing to combat this epidemic, Ingram said the numbers show that we are headed in the right direction, with fewer emergency-room overdose deaths and fewer hospitalizations in 2018 than the prior year, and an upcoming report that will show for the first time in 15 years, overdose deaths in Kentucky are declining. "It's been a long fight, but we are beginning to see some progress," said Ingram. "And it's really because of these kinds of collaborations." McKenzie-Wells talked at length about the Johnson County Community of Hope, a program that works in Family Court to address a whole array of issues commonly faced by people with substance-use disorders, whether that be access to housing or as is often the case, the need for a gas card to get them where they need to go. She reminded everyone that whether you know a person with a substance-use disorder personally or not, these are people who live in our communities and need our help. "This is a community problem, so let's work on the solution as a community," she said. "And I think that's what RESTORE is aimed at."